Eat yout zucchini, part 2: small, fresh zucchini and squash are a favorite of the farmers market goers here in mendocino. eaten raw or only briefly cooked, they bring lots of mild summer vegetable flavor to the kitchen table. summer squash salad is a fresh, california approach to the squash/zucchini playbook, using lime juice and avocado to fire up the offense and provide summertime vibes by the forkful. Eat your zucchini, part 1: summertime is fraught with wary exchanges as one tries to avoid having their neighbors' excess zucchini foisted on them. summertime zucchini fritters opens a new chapter in the struggle to consume this prolific fruit. hot fritters topped with cold cucumber-mint yogurt sauce will impress the hell out of your guests, or just make you full and greasy while you hang out drinking beer and watching 'mad men' on your day off. Its good to have a little chinese five spice around in case you get tired of the 'same old thing'. a few sprinkles of this stuff can enliven your mundane ingredients and give you a bonus life. beets with chinese five spice utilizes both the beets and the beet greens, and the plain yogurt has a nice cooling effect in this handsome dish. Napa cabbage originally comes from the beijing reigon of china. it is fairly common in europe where it is known as 'chinese cabbage'. here in the states not everyone knows what it is or what to do with it, but people are becoming familiar with kimchi, in which it is a key ingredient. the other day, in a discussion on the uses of napa cabbage, our friend rachael pointed out that it tastes great steamed with salt and butter. we gave each other an 'aha!' look and went home to try it. country cabbage is a simple, elegant dish that is well-suited for the supper tables of summer. Its nice when you can get your hands on some bacon from a local source (even nicer when the local source is organic). that way you dont have to feel weird about some epic slaughterhouse in the midwest and all the disappointing factors that go along with it. we got our hands on some of the local 'limited supply' and dug out an old recipe given to us over the winter: a luxurious melange from mark bittman of the new york times. sugar snap peas with bacon & mint is a nice appetizer on a summer evening and a real indulgence when paired with a cold dry white wine. Its getting hotter every day, sauerkraut season is just around the corner, and the river seems more delicious with the passing of each hot hour of the afternoon. we recently dined on lentils topped with yogurt: for a moment, in the late summer dusk, the warm evening seemed very indian, as if we were waiting for the monsoon season to begin. simply lentils is a dish that we hope will honor the venerable old tradition of lens culinaris, that humble seed of the near east. This year covelo organic is doing an italian dandelion, 'Clio' which is actually a kind of radicchio. On our way back from a wedding in santa cruz on saturday, we started thinking about how to use the 'dandelion' in a recipe for this weeks CSA box (we do a recipe for the covelo organic CSA every week). we hit on the notion of a dandelion pesto and it turned out nice: italian dandelion is in good company with walnuts, peccorino romano, garlic and olive oil. Most people like to drink something caffeinated in the morning. if you dont, good for you! but for everyone else, green tea, mate, coffee, and black tea are the order of the day (dont even mention energy drinks). sometimes its not about getting your day started, its about providing mental acuity and clarity in the afternoon or evening. coffee and black tea can be a real jolt to your system at that hour, and most people find that its pretty taxing to their overall feeling of health. guayusa tea is from the holly family, and a cousin of mate. however, it is not like mate: its more 'magical' and less high-octane. the guayusa leaf has the unlikely effect of calming and energizing ones mental state. how do we know its good for you and not at all harmful? it passes the the no. 1 litmus for a food or herb: it has widespread indigenous use in its native geography. on top of all this, guayusa tea is alkalizing to your system: a boon in these highly acidic times. We have a cherry tree in our yard this year. wow. its like this: unripe cherries, unripe cherries, unripe... woah, ripe cherries, woah birds are going crazy for them, woah so are the flies, woah can i just pick a few in the early dew covered morning please, all gone cherries! this morning i managed to abscond with a little a cup or two worth of cherries, perhaps due to being partially hidden in tall tall grass. safe in the kitchen, i sorted through my precious stash and was left with an even smaller amount after picking through them. this little cherry tart became my homage to summertime, a tiny love treat, in gratitude for the season. As we round the bend into summer, our thoughts turn to drip irrigation for the garden and trips to the river (swimming in the evening is one of the pleasures of summers in covelo). recently we enjoyed a rare quiet morning on the porch in the early sun. with a vegetable tart and some coffee to breakfast on, we watched the towhee, jay, and flycatcher in the garden. this savory solstice tart has the spice of turnip greens and deep vegetable flavor. Lets face it: heres a potential to prepare kale the same way over and over again: sauteed or steamed. it tastes great, and it gets you your vitamins. if you want to try mixing it up a bit, check out crunchy kale chips. this snack is a neat little appetizer before dinner and a nice pick-me-up in the afternoon. Springtime in covelo is 'a little bit of alright', and one of our favorite parts of spring is green garlic (sometimes called spring garlic). it starts out like the regular garlic that everybody knows, but is picked early and is not cured (dried). it looks a bit like leeks but green garlic can be smaller and often has a reddish color to the outer skin. turnips also make their presence known in spring, and when we do the farmers market for Covelo Organic Vegetables, we often have to defend the turnip from the slights of those who remain unaware of the teriffic spring flavor of this humble veg. while turnips are not particularly high in vitamins, they are 'chock full' of the cancer-fighting substances called glucosinolates. with these two ingredients in mind, we bring you black pepper turnips and green garlic, a dish we are quite fond of. turnips and green garlic sauteed in raw butter are a lovely thing: the essence of california provincial fare. So our latest kick (besides fermented fish oil) is ground elk and buffalo. the grocery here in covelo carries local meats, and we have a new way of preparing them. the seed of the idea was planted over the winter when we brought some raw ground buffalo to our friends for dinner. while its not the ideal dish to bring to such an occasion, our host quickly chopped up some mint and garlic, and before we knew it she was splashing hot sauce on some brazilian kibe. basically were talking meatballs, or little oblong patties. they make a great snack, light lunch, or supper, but if youre not careful youll eat about 80 of these buggers. we like to cook them on high heat and keep them a little raw in the middle, but go your own way. if you have access to meat thats not from a big meatpacking plant, hi-five! you are one of the lucky ones. btw: this recipe comes from the middle east (where it is deep fried and called kebbeh) by way of brazil, where it is a popular street food in rio and sao paolo. go figure. French fries are hard to beat. theres something about hot oil and salt that creeps into your psyche. however, the recent info regarding the high (highest!) levels of agricultural chemicals in potatoes is pretty discouraging. in the wake of this blow to our culinary predilections, we discovered that coconut oil can be used to make amazing french fries. and heres how we did it: slice the potatoes real thin, put some coconut oil in a cookie sheet, bake them until browned, put some salt on and munch. technically theyre chips not fries, but eating these hot chips is very near the experience of eating french fries. we call this recipe cook your own damn chips. makes a great appetizer to keep your friends chuffed while the cold beer is making the glasses sweat. It seems like cakes have fallen out of favor: perhaps due to the flimsy, sugary, flavorless cakes that supermarkets churn out for peoples birthdays and office parties. making your own cake is a decent skill to have, and its lots cheaper than buying one. lately, we have been interested in olive oil cakes, and most of the recipes seem to come from italy, so we assume this is an italian baking tradition. olive oil cakes are delicious: dense and rich in a way that other cakes are not. last night we sat down to big slices of our orange-infused olive oil cake with glasses of homemade buttermilk from our friends who keep goats. the rich chocolate icing, the spongy orange-flavored cake and the fizzy buttermilk were an amazing combination. today our friends stopped by and finished off the rest of the cake, so we know it still tastes good without buttermilk! Theres something about pastry with coffee. damn! they just taste good together. but you cant go around eating pastries for breakfast every day of the week any more than you can keep smoking your whole life. for a few years in college, we all got to smoke and eat pastry for breakfast, but now we have to be sensible. nutty biscuit spirals are a nice way to indulge oneself without going too far. when theyre fresh they go with coffee hand-in-glove. the whole wheat flour imparts an almost biblical flavor, but maybe im just imagining things. We dont eat much fish: usually we cant afford it, and sometimes we feel a little bad for the diminishing fish populations. Still, we probably would eat more fish if we had a neighbor or friend who was a fisherman/woman, and its always nice when your host serves up a lovely bit of seafood. That whiff and savor of the briny deep that fish, mussels or even seaweed has: lots of folks crave that experience, possibly because our ancestors consumed so much of it. One type of seafood we buy occasionally is sardines: theyre on the 'ok' section of the sustainable fishing chart, low in contaminants such as mercury, and high in omega 3 fatty acids. they have a strong flavor so a little goes a long way, and theyre a key ingredient in our hearty fishermans pasta. its easy to imagine tucking into a bowl of this stuff at some low-rent restaurant in greece. p.s. make sure you get sardines that are packed in water. Preparing chard so that its not the 'same old thing' can be a challenge. we eat lots of the stuff, and have gone through many different recipes in an effort to keep it exciting or at least desirable. ruby pulled off a coup recently with a spicy chard dish which achieved both. we decided to call it spicy hawaiian chard: something about the hot peppers and ginger made us think about the coarse sands and warm trade winds of the 'big island'. Its a good idea to have some miso and soba noodles hanging around so you can make supper even when the cupboard is kinda bare. if you have a couple of old vegetables in the fridge you can put it all together and have a nice little repast. recently we hit upon the notion of using green tea as part of the broth, and wow that was a good idea. On a chilly march night as the snow threatens to fall over the oaks and pines, green tea & miso broth with soba noodles is a lovely thing. Sometimes its nice to share coffee with your friends in the comfort of your own apartment. when work commitments will allow such frivolous expenditure of time, it may be a sign that things are going pretty good- and perhaps this kind of bohemian trend wants encouraging. nowadays so many things revolve around the coffee shop it may be difficult to remember the last time you hung out with friends over coffee at your own place. 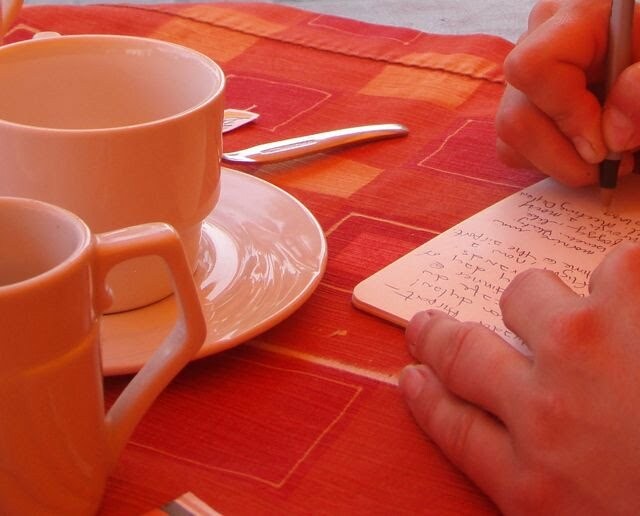 we think getting an invitation for coffee is mad decent, but it often leads to the question, 'what should i bring?'. heres what we came up with: louis armstrong record, bird guide, plate of party scones. One of the best things we made this year (whoops, last year) is pickled cauliflower. now that its winter, the tangy crunch of ye olde P.C. is even more appetizing, and it makes for an excellent side or condiment. technically its fermented cauliflower, and the lacto-fermentation process creates a dish that is wonderful for your digestive tract (the place that chinese medicine says is responsible for 80% of your health). if you have access to a few heads of cauliflower, a crock, salt and some good chilies, you may as well give it a shot. put it all together and mark it on your calendar, because youve got to wait several weeks. we are finding that it goes great with lots of things: eggs, sandwiches, meats, rice, snacks, salads. OK, it pretty much goes with everything, unless you dont like the stuff. in which case youre cut from the team. P.S. dont worry if you didnt like that mushy cauliflower your mom made you eat- this is a lot better than that. Quinoa is classed as a superfood because its not missing the key amino acid lysine like most other grains... it has all the amino acids needed for proper muscle and tissue function. its also got a load of other crap: iron, potassium, riboflavin, thiamine, B6, niacin... its a long list. we have the incas to thank for quinoa, who called it the 'mother grain'. also, though quinoa is most often referred to as a grain, its actually a seed! and contains high amounts of folic acid, which is awesome. anyways, quinoa pancakes are in pretty high demand around our place. they have a beady texture that makes them fun to eat, and a bit of sesame flavor which adds a whiff of bangladesh to your head-space. they go just as good with butter, jam, honey and black coffee for a breakfast thing as they do with pork, mustard and sauerkraut like something out of a WWII movie. also, this happens to be a gluten-free recipe. For a long time, we've been trying to find a good face cleaner or scrub that was organic, or at least non-toxic. if you want to wash your face with something other than regular soaps (not recommended), there aren't many cool products out there. we finally got a hint from a friend and experimented with it until we arrived at a recipe we were really happy with. green tea and honey facial scrub is an awesome mask and/or scrub that feels, smells and works better that anything weve ever seen. the near-magical powers of raw honey are now common knowledge, and its great to get some of that archaic know-how back in the game. For those of you who didnt make it to bioneers but wish they did, we have the next best thing: a 3-day rundown of the presenters with links pertinent online material. we did the homework for you: just go to our blog and scoop the whole thing. One thing that really goes with scrambled eggs is biscuits. of course, theyre good for all kinds of things, but weve been keen on this particular combination of late. now, they cant be any old biscuits, they have to be good and do good (ha! salem). after a fair amount of trial and error, we have arrived at a plateau of sorts: we bring you whole grain biscuits. these baked doubloons dont take long to sort out, and we encourage you to give it a go. on the day before thanksgiving, after lots of work and errands, its pretty nice to lay around in the afternoon sipping gunpowder green tea and noshing down scrambled eggs with cheese and about 83 of these biscuits. Everyone should make a trip from wherever they are to 'mac down' on the seasonal explosion of apples, wherever that may be. its a shame to let this abundance go to waste, and around here there are a lot of unpicked apples just doing their prelapserian thing. ruby lit on the notion of making apple butter, and after a few trial runs, she came up with the now-legendary sassy apple butter. its a nice way of traveling into the future of a lovely morning indoors, with a pot of tea steaming on the table and a big bite of toast laden with the fruit of your modest efforts. This time of year the quince are ripe on their trees. the aroma seems ancient: deep and intoxicating, but somehow still very light. we have a big basket of them in the bedroom and they are filling the house with their scent. you can find quince at the farmers markets or middle eastern markets october through december. many people haven't tried this fruit since its not something you can pick up and take a bite of- they're very hard and require cooking before they surrender their finer characteristics. quince preserves are a great way to get up to speed on the matter. During the summer, the chilies produced an abundant crop (by chilies we mean spicy chilies or tree chilies, not peppers). we ate many meals flavored with chilies but there were more chilies than we could eat. eventually we hit on the idea of stringing them up on thread and hanging them from the ceiling, which is a venerable tradition. you know you're going at it old-school when you're laid out on the floor stringing up baskets of chilies with your significant other. now, several months later, these dried chilies are turning up in our day-to-day cooking. they pack a nice bit of flavor into a breakfast fry-up, and lately we have been hooked on a late morning breakfast of steamed greens with chili-fried eggs and toast . lately weve been getting into raw butter, and when used in this recipe its a lovely thing. We love cold bean salads. oily and salty, their earthy flavor is something we just dig. they are inexpensive to make, great for showing off seasonal ingredients and a relief to have in the refrigerator when things are hectic. sometimes you only have three bursts of energy left and all you can do is: 1) grab some food, 2) fall on the couch, 3) turn on a DVD. dont fake the funk- you know what im talking about. so here is our recipe for white bean and arugula salad: with some quality ingredients this dish can really wow you. arugula is a real boon in the winter months, and its unique bitterness shines here. Autumn is lovely here in round valley... with a little rain the mushrooms are coming up, the oaks are having a banner year for acorns, and everywhere the deciduous trees are yellowing and losing their leaves. anyways- often i go to bring ruby some breakfast at the coffee shop, and yesterday i revived an old recipe we used to use in new york, chopped egg & tumeric salad. this egg salad on some toast is a 'little bit of all right', and the tumeric powder gives it a nice boost. tumeric is one of those roots that traditional peoples have been using for ages. its got loads of beneficial properties as well as an interesting flavor. It wouldnt be very cool of us to let summer go by without mentioning something we have been doing every day: the blend-up. first thing in the morning we get out the vita-mix, a young coconut (fyi: there is a rumor that these are no good due to a formaldehyde bath or irradiation- email us if you know about this), and some sprouted almonds. these are the basics of a food beverage to which we add whatever is fresh and handy: frozen bananas, blackberries, raspberries, peaches & fresh goats milk. another thing that often makes it into our blend-ups is Cacahutal Synergy Blend, a powdered blend of raw cacao, maca root, mesquite meal and lucuma fruit which gives you a crazy energy that feels awesome (the guys & girls at BPC really deserve a hi-five for this one). having coconut in your diet is becoming an increasingly suave move since its salutary properties are now common knowledge. the sprouted almonds give a kind of nutty milk flavor that we find delicious: just coconut and almonds blended up is pretty darn tasty. this WI entry doesnt include a recipe- its more of a 'heads up' on our version of something that many are doing in their own way. we like tasty stuff, and its easy to achieve a great flavor as well as a nutritional boost with this technique. because sometimes getting out of bed is not what you want to do, and drinking something that tastes and feels delicious is going to make your whole day better. besides, you can always drink coffee on your way to work. Last week we drove over the pass from covelo to paskenta in the central valley. 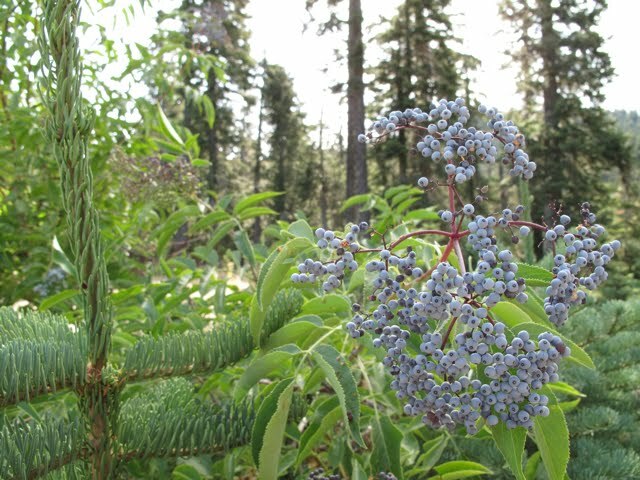 the route winds through the yolla bolly wilderness, and this time of year there quite a few blue elderberries growing right on the side of the road. after searching around for the ripest berries, we picked a paper grocery bag full and took them home to make elderberry syrup. the method we used is one that can apply to a number of different berries: simmering them for several hours, straining, and mixing that with honey. traditionally, alpine folks have made elderberry syrup and tinctures so they can draw on the health benefits of this amazing berry in the depths of winter. Bioneers is coming up, and soon fall will be filling the yards with leaves and the smell of rain. We have been fans of author sandor katz for a while now. his book wild fermentation is a necessity for anyone interested in food saving, health and traditional knowledge. last fall we went crazy making copious amounts of delicious sauerkraut and kim-chi. this year, a bumper crop of green beans inspired us to spend a day canning. dilly beans is a vinegar-style pickling process from sandor’s book. vinegar-pickled beans will last indefinitely once properly sealed in the heat bath. now, dilly beans are technically not a fermented food, since the vinegar prevents microorganism action. but they are pretty tasty, especially in the winter when youre sitting around the table with some friends drinking beer after dinner. One funny thing about food is that sometimes people dont think they will like something and then you give it to them and theyre like 'wow'. coconut-melon sorbet is a good example. it doesnt sound like anything i would particularly want to try unless i was stuck on the beach in Monaco and a dude came by selling ice cream and this was the only flavor he had. but ruby is a girl for knowing what kind of thing is really gonna liven up your mind and spirit, and when i reluctantly accepted a small cup of this i was not prepared for how much better that hot, hot afternoon was going to look after just one bite. p.s. its not that hard to make.